Suitable for the removal of small nucleic acids fragments from plasmid DNA preparations and precipitaiton of DNA from SDS-containing samples. Widely used in protein crystallization and in the determination of heavy and transition metals in biochemical samples by ion chromatography. 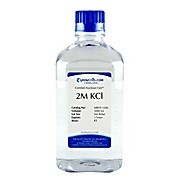 KCl solution can be used for extraction and solubilization of proteins. May also be used in the preparation of PBS and as a storage buffer for pH electrodes. Suitable as a reference solution for conductivity. Sterile Tris-buffered Saline (TBS) prepared with 18.2 megOhm water, 0.2 micron sterile filtered and steam sterilized in final packaging.